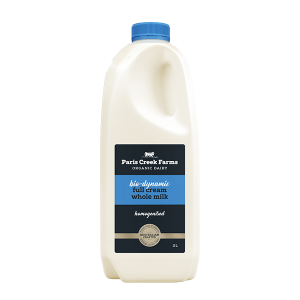 Bio-dynamic Reduced Fat Milk is made with certified bio-dynamic organic milk produced from cows that graze on lush South Australian bio-dynamic natural pastures, with no genetic modification, no preservatives or anything artificial added. This Reduced Fat milk is homogenised and contains 50% less fat than the Paris Creek Farms’ Full Cream Whole Milk. Certified Bio-dynamic Organic Reduced Fat Milk. CONTAINS MILK. 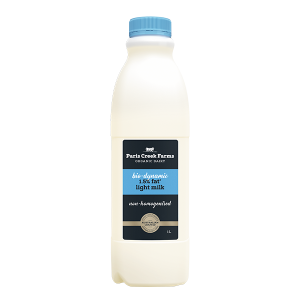 Homogenised and Pasteurised Reduced Fat Milk.